You ask me what it is to have writer’s block. Listen to me. Here I am, a seasoned veteran and a professional on the subject. 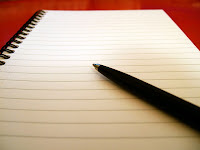 Plagued with writer’s block, I sit and stare at blank paper for hours trying to find words to write. After a period of time, I finally begin. Not liking what I write, I start over. Then, I start over again and again and again, until I’m frustrated and can think no more. If I were smart, I’d take a break, but I’m not that smart, so I continue trying to write some assignment or project in hope of pleasing a teacher or satisfying an editor. By now, my frustration has escalated and reached a new level. I start to hate writing. I make irrational ejaculations: “Who invented writing anyway? I’d like to punch him in the face!” I mock my editor or teacher in a whiney squeaky voice, “ ‘This will make you a better writer,’ she says.” If I were smart enough, I’d take a break and cool down a bit; however, I continue as if on a mission, and as I shake my fist angrily at my pen I think to myself, “I will finish this damn project! Even if it kills me,” so I write some more. I crumple the pages of my old ideas. I crumple the pages of my new ideas. I crumple the pages of ideas yet to come, and I wish all paper would disappear. After hours of crumpling, I have collected enough bad ideas to torch a small town. Still plagued by writer’s block, my frustration spills over into the ‘No Zone’. Now, I wonder if writing is the invention of the devil, and whether if I’m in one of Dante’s rings. In a desperate attempt to make the project disappear, I perform an irrational act: I rip the project page in half. Then, I rip those halves in half. Then, I rip those halves in half again and again, until all I am left with is confetti. I stab my text and hope to kill it. I hurl my note book at the wall and stomp on it. I curse the discovery of writing and the invention of paper. I pray to God that this is just a dream, but deep down, I know it’s not a dream. I pray that my teacher or editor does not show up for work. I explain to God, “Nothing serious, maybe diarrhea or an alien abduction.” Then finally, I quit writing and take a long-needed break. Only to return the following the day and complete the assignment without an ounce of trouble. This is writer’s block. I highly recommend the book, "The Courage to Write: How Writers Transcend Fear" by Ralph Keyes. But I can't write about it.